I rewatched it about a week ago., found it on Amazon.com. I saw it when I was 12 at the theater when it was first released and loved it. I was 10 when this was in the theaters. I missed it at that time, and have been encountering references to it ever since. I finally got around to seeing it today, on DVD. It's one of those epic films, so long that they had intermissions to allow moviegoers to visit the restroom (and the snack bar) midway through. While many pop-culture touchstones seem hopelessly dated to me when viewed now (e.g., Dr. No), I was impressed by the acting and scope of this film. 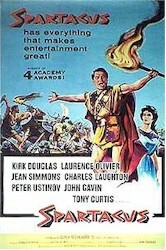 Except for the "singing" of Tony Curtis' Antoninus, that is.